I'm a big believer in making online backups to complement my local backup solutions. That way, heaven forbid there's a fire or something, my data will live on in the cloud. Alas, I've always been a little too cheap to pony up the $50-60 annual fee for a service like Carbonite or Mozy. But $27.47? That I can swing. From now until December 31, you can save 50 percent on Carbonite's subscription plans. That means you can get one year for $27.47, two years for $49.97, or three years for $64.97 (definitely the best deal). To take advantage of the offer, just sign up for a new account and use coupon code CUST50. 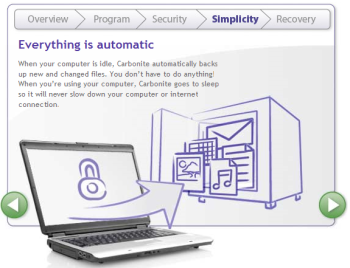 If you're not familiar with Carbonite, take a look at Jon L. Jacobi's recent review. He called it a "pretty darn good backup service," despite a bit of confusion during the setup process. After all, $64.97 for three years is only a five bucks more than I'd pay for one year of Mozy's unlimited service. That's hard to pass up!